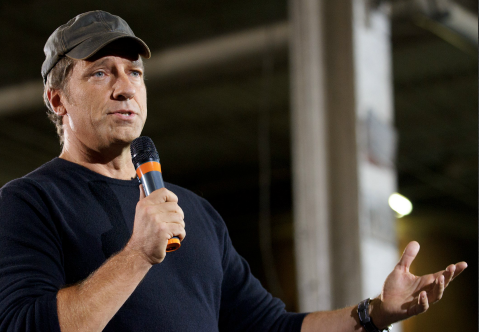 Mike Rowe, best known as the host of the Discovery Channel series "Dirty Jobs," took to Facebook on Tuesday to bemoan the "epidemic of fatherlessness," which he said affects every level of society. While discussing an anti-bullying program for his web series, "Returning the Favor," Rowe considered the connection between the rates of fatherless children and the societal ills of bullying, poor educational achievement, homelessness, suicide, and violence. "Is it really so surprising to learn that a majority of bullies also come from fatherless homes?" Rowe asked. "As do a majority of school shooters? As do a majority of older male shooters?" Rowe admitted that the topic is controversial and likely not to earn him many fans among those who seek a one-dimensional solution to the problems plaguing young men. "I know this is controversial," he wrote. "I'm sorry to inject an uncomfortable element into a post about a ‘feel-good' show, but I think it's important to consider the possibility that this thing we like to call ‘an epidemic of bullying,' is really an ‘epidemic of fatherlessness.'" Rowe also pointed to the fact that society and social media provide males, regardless of age, with a convoluted and conflicted message about masculinity. "It's reasonable to conclude that our society is sending a message to men of all ages that is decidedly mixed," Rowe wrote. "On the one hand, we're telling them to ‘man-up' whenever the going gets tough. On the other, we're condemning a climate of ‘toxic masculinity' at every turn." He argued that it is difficult enough for young men with a stable family support structure to distinguish what is expected of them from society, let alone those without a present father figure. "If that strikes you as confusing, imagine being a 14-year-old boy with no father figure to help you make sense of it," he added. Rowe did not dismiss the seriousness of bullying, but attempted to paint it as a symptom of the disintegration of family support structures. He lambasted efforts to blame societal ills on "social media," "guns," or genetic deviations, arguing that such excuses only serve to disguise the problem at hand. "The bullying crisis is real, but the root cause has nothing to do with video games, or guns, or social media, or rock and roll, or sugary drinks, or any of the other boogymen currently in fashion," Rowe said. "Nor is it a function of some new chromosome unique to the current crop of kids coming of age." Rowe said that the children of recent generations are not radically different from those that preceded them; rather it is "the parents who have changed." "Kids are the same now as they were a hundred years ago—petulant, brave, arrogant, earnest, frightened, and cocksure," he wrote. "It's the parents who have put their own happiness above the best interests of their kids." Such sentiment has resulted, Rowe claimed, in a generation of parents who have abdicated their responsibilities to raise well-adjusted children, opting instead to allow the community to play an ever-increasing role. "It's the parents who actually believe ‘the village' will raise their kids," Rowe said. "When the village is profoundly incapable of doing anything of the sort." This entry was posted in Culture and tagged TV News. Bookmark the permalink.